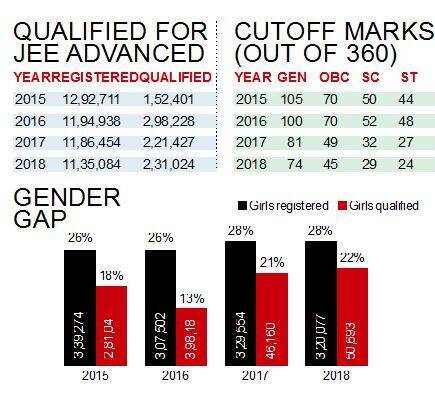 The cutoff marks too have been falling while the representation of girls among the qualifiers has increased in the last two years. In the JEE Main results declared this week, 2.31 lakh students have qualified for JEE Advanced (IIT entrance). These were out of 11.35 lakh candidates, a count that has fallen successively since 2015. The cutoff marks too have been falling while the representation of girls among the qualifiers has increased in the last two years. Given the enduring crisis of judicial appointments in India, it is somewhat ironical that there has so far not been a book that provides, in one place, a snapshot of the politics, doctrine, history, and developments pertaining to this . Appointment of Judges to the Supreme Court of India: Transparency, Accountability, and Independence, (eds) Arghya Sengupta and Ritwika Sharma (OUP:2018, Rs 750), fills this gap. It is a collection of 21 essays by jurists and legal scholars, including T R Andhyarujina, Pratap Bhanu Mehta, Arvind Datar, Raju Ramachandran, Gopal Subramanium, Justice (retd) K T Thomas, Peter McCormick, and Arun Jaitley. 2 What is cricket’s pink ball challenge about? 3 Why did China agree to Wuhan?